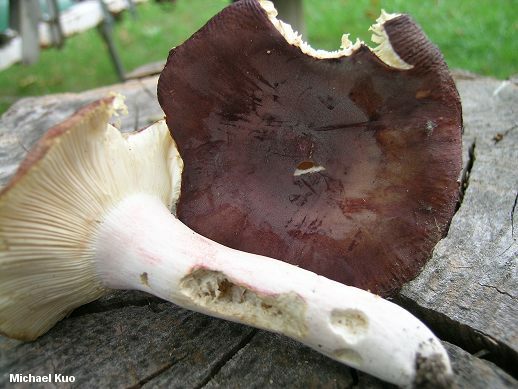 This gorgeous Russula is common under oaks in eastern North America. 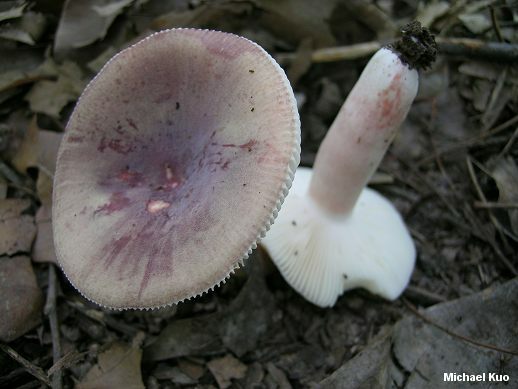 It has a purple cap that is covered with a white dusting or "bloom," and its stem is flushed with a paler version of the cap color. 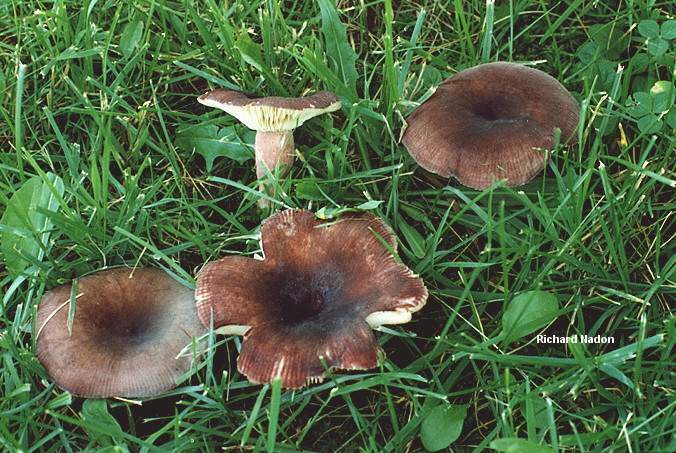 The spore print is cream colored to pale yellow, and the taste is mild or slightly oily and unpleasant. 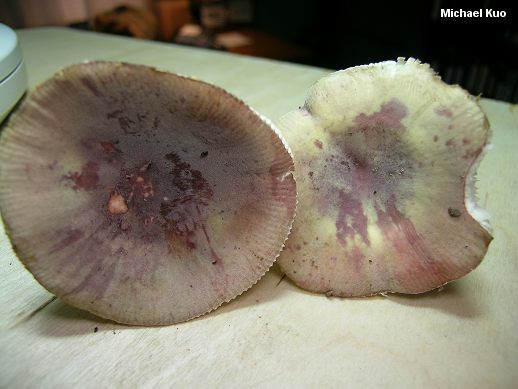 As the illustrations to the right demonstrate, Russula mariae can display cap colors that range fairly far away from purple, including olive, yellow, and brown--or it can be mottled with several shades at once. 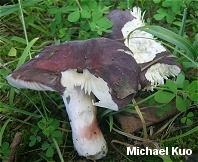 Russula alachuana is probably a synonym. Ecology: Mycorrhizal with hardwoods, especially oaks; growing scattered to gregariously; common and frequently encountered; late spring to fall; widely distributed east of the Rocky Mountains. Cap: 2-7 (-10) cm; convex when young, becoming broadly convex to flat with a shallow depression; dry; when fresh with a whitish bloom or dusting; purple to purplish red, or reddish, pinkish, or even olive, yellow, or brown--sometimes mottled with several of these shades; the margin usually lined by maturity; the skin peeling fairly easily, usually more than halfway to the center. 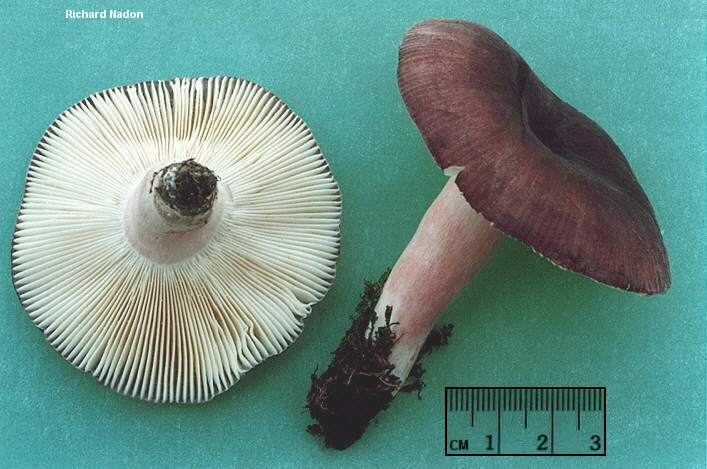 Gills: Attached to the stem or beginning to run down it; close or crowded; sometimes forking; white but soon cream colored to pale yellow; occasionally with pinkish edges from contact with the stem in the button stage. Stem: 2-6 cm long; .5-2 cm thick; usually flushed pink or purplish; dry; fairly smooth, but feeling greasy or sticky to the touch. Odor and Taste: Odor oily; taste mild, slightly acrid, or oily and unpleasant. Chemical Reactions: KOH on cap surface orange. Iron salts on stem surface negative. Spore Print: Creamy to pale yellow. 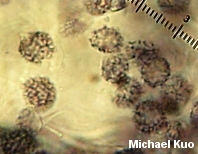 Microscopic Features: Spores 6.5-8.5 x 5.5-8 µ; usually globose or subglobose; warts and ridges up to 1.2 µ high; connectors usually forming partial to complete reticula. 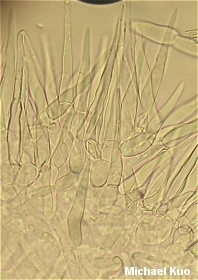 Pileipellis a cutis underneath a turf-like layer; the uppermost hyphae septate, with the sub-terminal cells barrel-shaped and the terminal cell clavate, cylindric, or (more commonly) elongated-fusiform; clearly differentiated cystidia (aside from the fusiform hyphal ends) absent; elements hyaline to faintly purplish in KOH. REFERENCES: Peck, 1872. (Saccardo, 1887; Burlingham, 1915; Beardslee, 1918; Kauffman, 1918; Bills & Miller, 1984; Arora, 1986; Kibby & Fatto, 1990; Phillips, 1991/2005; Lincoff, 1992; Metzler & Metzler, 1992; Barron, 1999; McNeil, 2006.) Herb. Kuo 08290504, 07160803, 07210803.